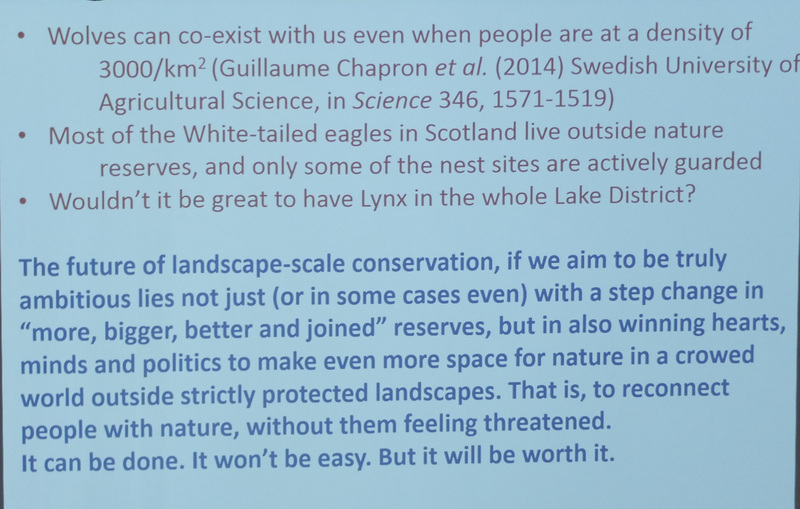 Professor Sir John Lawton is a cult hero in conservation circles on account of his report ‘Making Space for Nature’ which is often simply referred to as the Lawton Report. 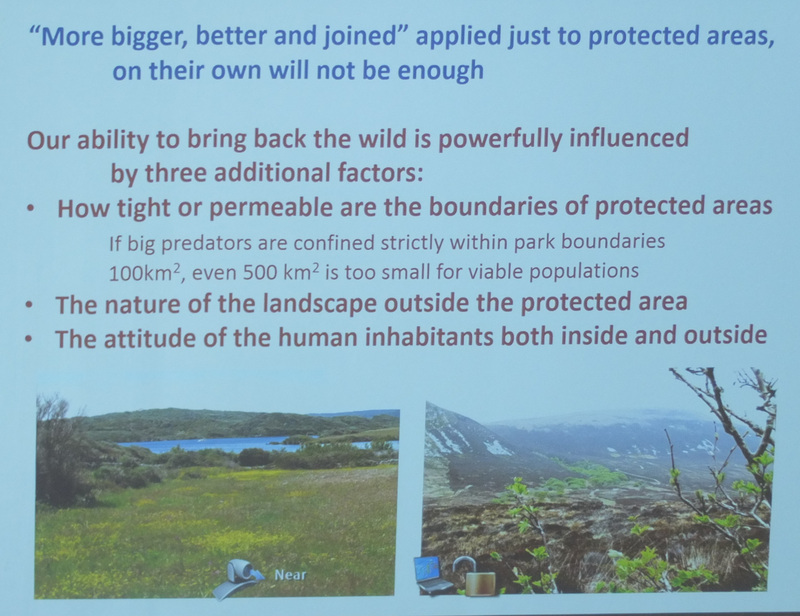 In essence the report states that we need more wildlife sites, existing sites need to be bigger, they need to be better managed and we need to join sites together via habitat creation initiatives. This simple formula is summarised as more, bigger, better and joined up. You can download the full Lawton Report here. Dartmoor and Devon owe a great deal to John Lawton – the acquisition of Fingle Woods by the National Trust and the Woodland Trust back in 2013 may well not have happened without his report. At the time I was the General Manager for the NT on Dartmoor and negotiated the WT partnership and the acquisition – one part of this involved getting approval from the NT’s Executive Team which included Helen Ghosh, the Director General, Simon Murray, then Director of Operations and Peter Nixon, the Director of Conservation for the £4m project. Fortunately they had read the Lawton report, had had a meeting with John and were very enthusiastic about what it meant for the National Trust. When I arrived at Heelis for the Projects and Acquisitions meeting it could not have been easier – they had, I think approved it before I even began to speak…. if only the process of getting the funding for the project to restore Castle Drogo had been so easy! 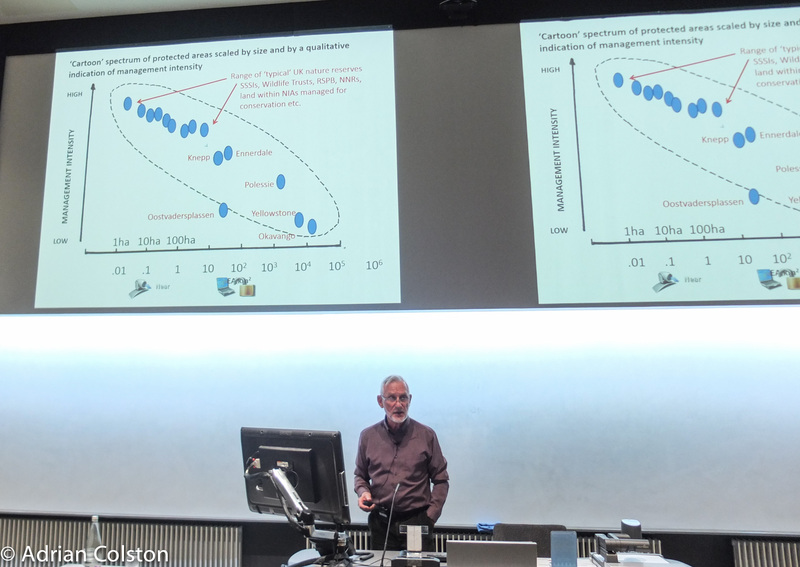 Last night I went to a lecture at the University in Exeter given by John Lawton on his vision for nature and the tactics needed to achieve it. It was well attended and very entertaining. Lawton is a distinguished academic ecologist and is politically very savvy. In addition to his report he is responsible for England’s 12 Nature Improvement Areas and the network of Local Nature Partnerships. His vision however goes way beyond what Government has permitted and funded to date and that was the subject of his talk. He talked about his version and vision for a ‘re-wilded’ Britain. He compared and contrasted his ideas with those of George Monbiot. In essence he suggested Monbiot wanted to remove the people and let nature do its thing assisted by re-introduced herbivores and carnivores. His brand of re-wilding involved a ‘coalition of the willing’ who worked together skilfully using agricultural subsidies and economic benefits to achieve change at scale. 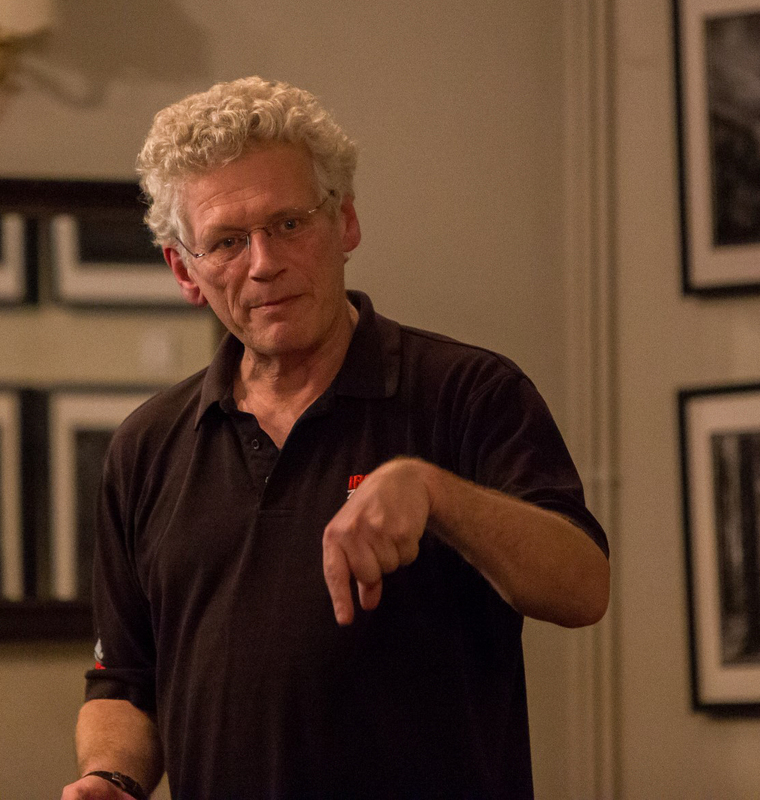 He quoted two English examples – Wild Ennerdale in the Lake District and the Knepp Estate in Sussex and he went on to compare and contrast these with the truly wild landscapes of the Okavango Delta in Botswana and Yellowstone National Park in the US, the semi wild reserve at Polessie in Belorus (created following the Chernobyl nuclear reactor disaster and evacuation) and Oostervardersplassen the created reserve in the Netherlands. Wild Ennerdale is a partnership between the National Trust, the Forestry Commission and United Utilities (a water company). By reducing intensity of management by lower stocking levels peaty water no longer rushes from the fells into Ennerdale reservoir and therefore there is no need for a water purification plant. United Utilities spend 60x less funding the re-wilding project than they would have spent running a water purification plant. Nature, the economy and people all benefit. Knepp (which I visited and written about before – see here and here) is a project set up on a 3500 acre lowland Estate in Sussex by Charlie Burrell. Formerly an uneconomic arable farm it has been allowed to re-wild over the past 15 years and is extensively grazed by herds of long horn cattle, Exmoor ponies, Tamworth pigs and deer. The resulting ‘savannah’ of grassland, scrub and woodland has become a rare lowland haven for declining species such as the turtle dove, cuckoo, nightingale and purple emperor butterfly. 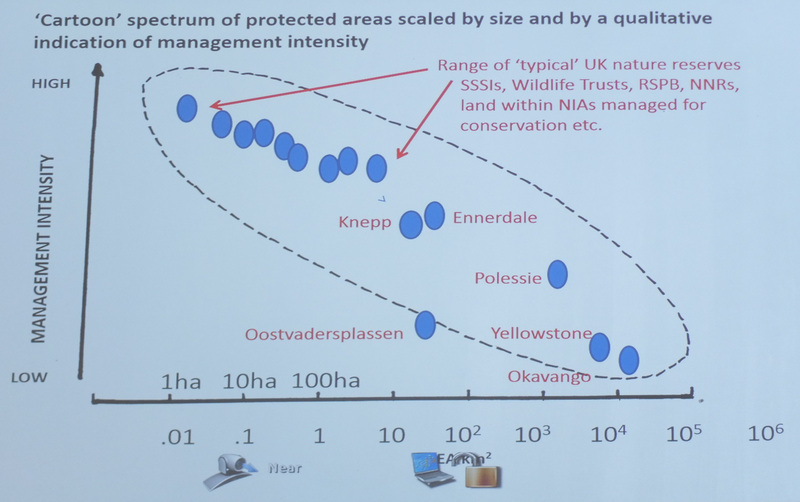 In this slide Lawton demonstrated how management intensity (by people) decreases with scale, it also shows where UK nature reserves sit and why ‘more, bigger, better, joined up’ is needed. 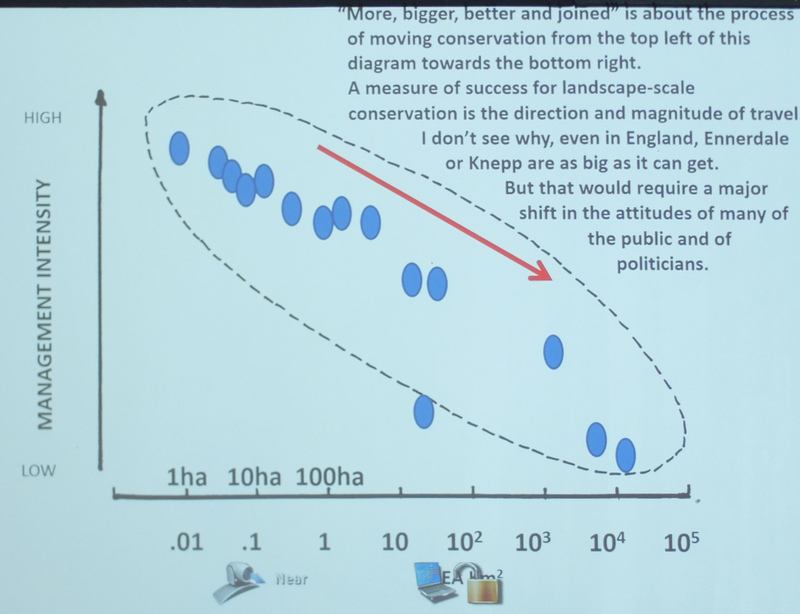 Lawton also made the case for re-introducing the lynx in the Lake District and challenged the audience by saying ‘why not Devon too?’ He suggested that lynx would be able to control the burgeoning population of deer. He also re-emphasised the role of conservationists in winning hearts, minds and politics. Finally he concluded that special places needed permeable boundaries so wildlife could come and go. An inspiring evening by a great champion of wildlife. Thanks to the Devon Local Nature Partnership, Devon County Council, Devon Wildlife Trust and the University of Exeter for organising it. It is now up to the Devon Local Nature Partnership, local NGOs, conservationists, land managers, farmers and the residents of Devon to come up with some ideas and projects to create more spaces for nature, which are bigger, better managed and more joined up in Devon for the benefit of wildlife, people and the economy. 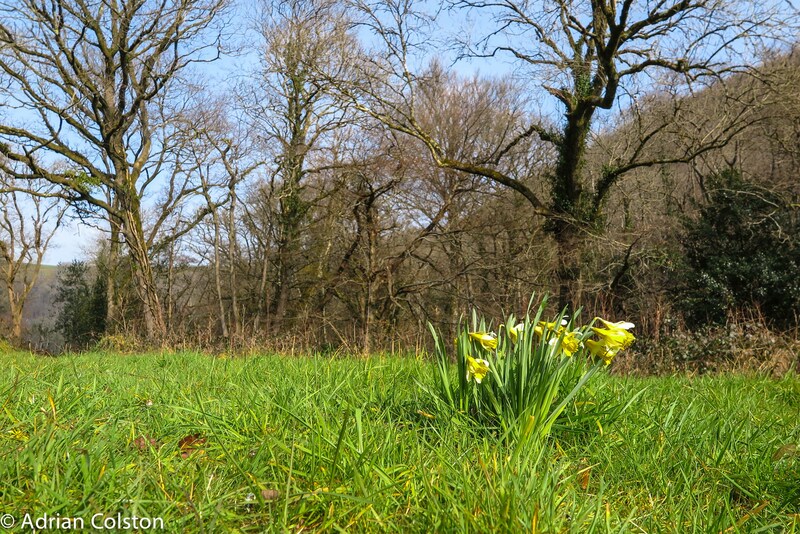 Last Sunday I went for a walk to Cod Wood to see how the wild daffodils were doing. I parked up at Steps Bridge and took the permissive path along the river to Cod Wood. This is not the first time that this situation has arisen. The Dartmoor National Park Authority pay the landowner to allow access through the woods so that the National Trust and Woodland Trust woods beyond can be reached. 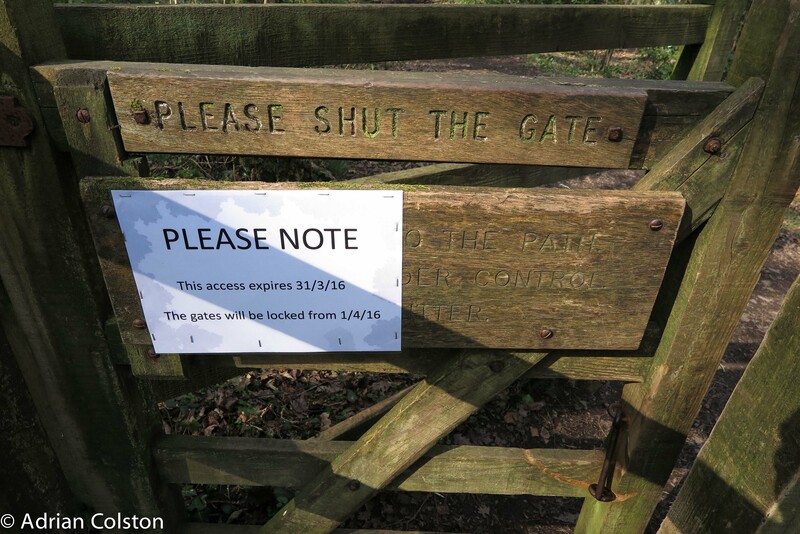 This sign appears to suggest that no agreement for the future has yet been reached and therefore the gate will be locked on April Fool’s Day. In the times of austerity the DNPA has a lot less money than it used to have and therefore reaching agreements like this and being able to pay for them is much more difficult. UPDATE: I have now been contacted by three reader of my blog who have told me that the reason that the access agreement is ending is not as a result of financial wranglings between the owner and the DNPA. Apparently the owner is fed up with anti-social behaviour by a minority of people using the permissive path (e.g. dog fouling, littering, abusive comments etc). As a result he has had enough and who can blame him. I wonder whether there might be another solution. 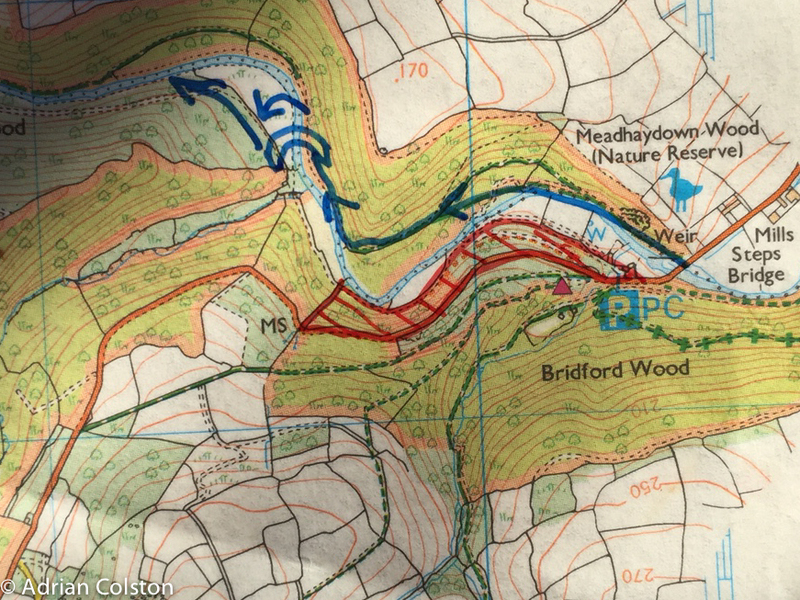 The area hatched in red is the piece of woodland where the access agreement is in place – beyond the red area the woods are owned by the National Trust. The National Trust also owns the woodland to the north of the River Teign – marked as ‘Meadhaydown Wood (Nature Reserve)’ and known as Dunsford Nature Reserve. It leases this to the Devon Wildlife Trust. There is a well used track through the nature reserve by the river. Perhaps a long term solution might be to build a footbridge across the Teign from the Dunsford Nature Reserve into Cod Wood? It would be expensive in the short term but would solve the access problem once and for all. There of course might be very good reasons why this is a bad idea (e.g. impact on wildlife, impact on Dunsford Nature Reserve and aesthetics) but perhaps it is worth exploring. 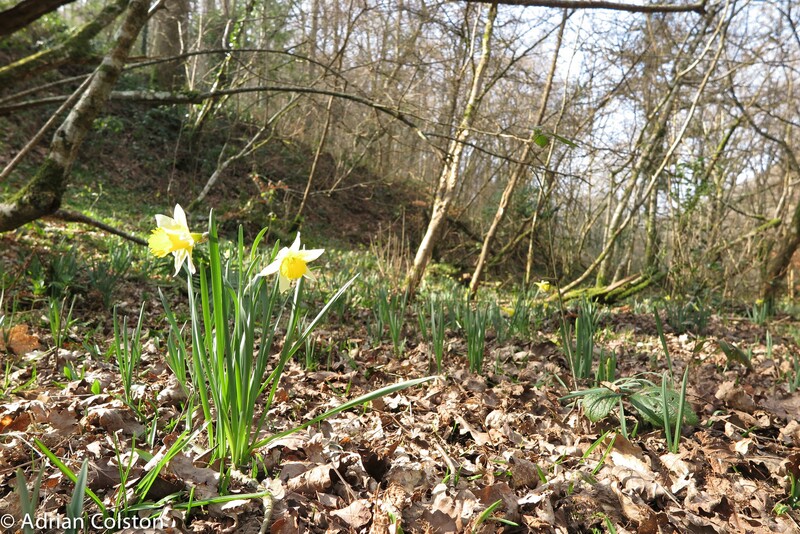 When people think of wild daffodils on Dartmoor they normally think of the Devon Wildlife Trust’s reserve Dunsford Wood at Steps Bridge. 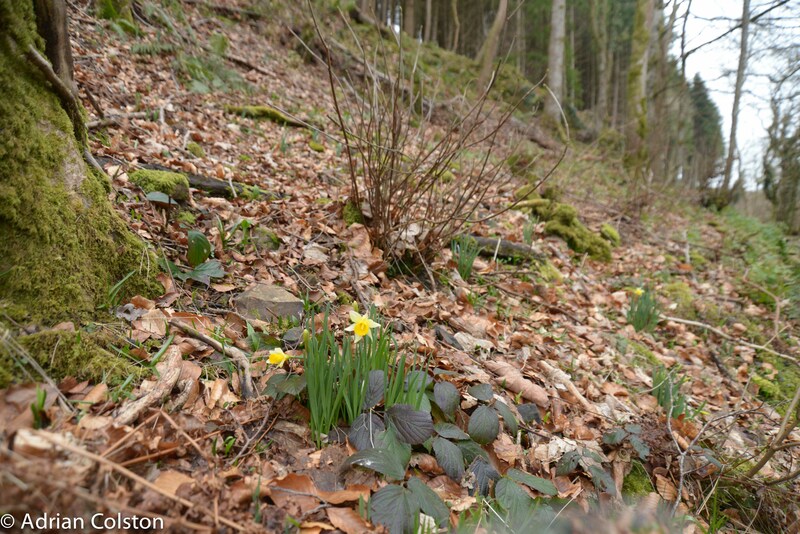 There is indeed a good colony of wild daffodils there but there is also a large population in Cod Wood (SX783896) on the other side of the river. Cod Wood is owned and managed by the National Trust and Woodland Trust and is part of Fingle Woods. It can accessed from the Clifford Bridge end or from the car park up from Steps Bridge. There is a new walking and cycling track along the river which greatly improves access. 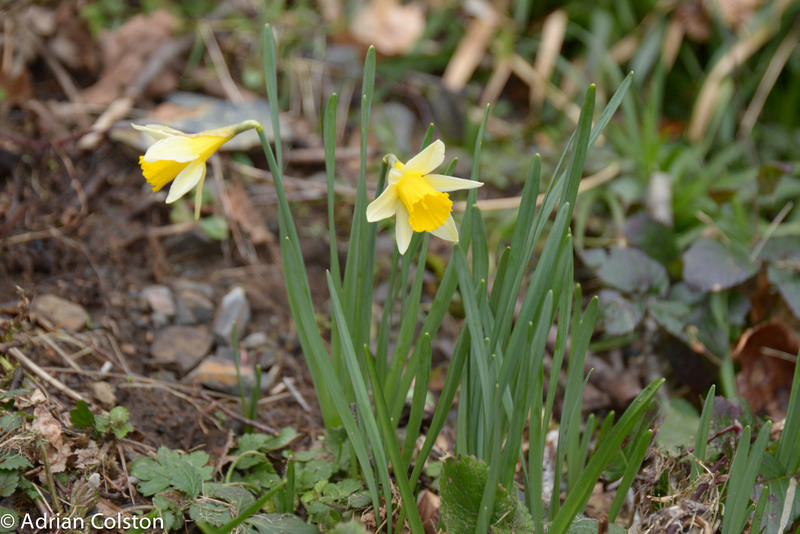 The wild daffodils are only just starting to flower. 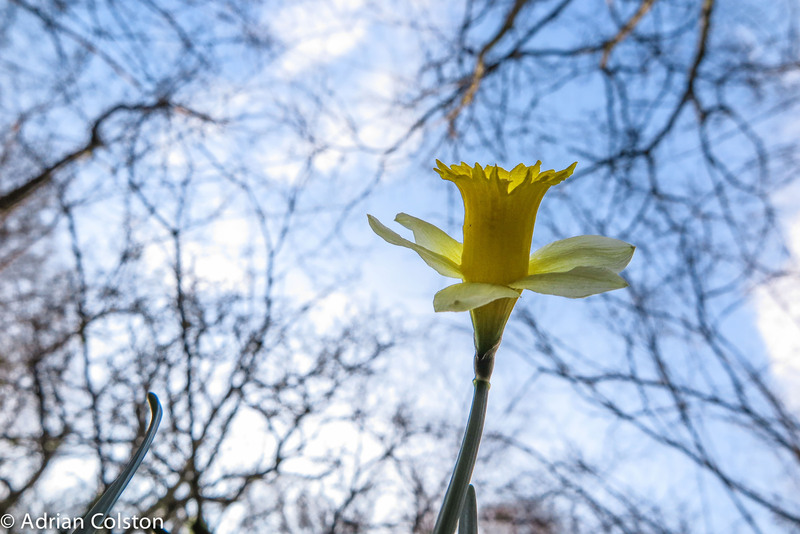 These are wild native plants – cultivated varieties of daffodil have been flowering for a while now and some are bred to flower very early in the year. Most plants are still in bud so I would think the spectacle will be most impressive in a week to ten days time. I went on Thursday and had a look around a project which is in the process of restoring Wooston Castle. This was a project I was involved with when I worked for the National Trust. Wooston Castle is part of Fingle Woods – the joint partnership project between the NT and the Woodland Trust. 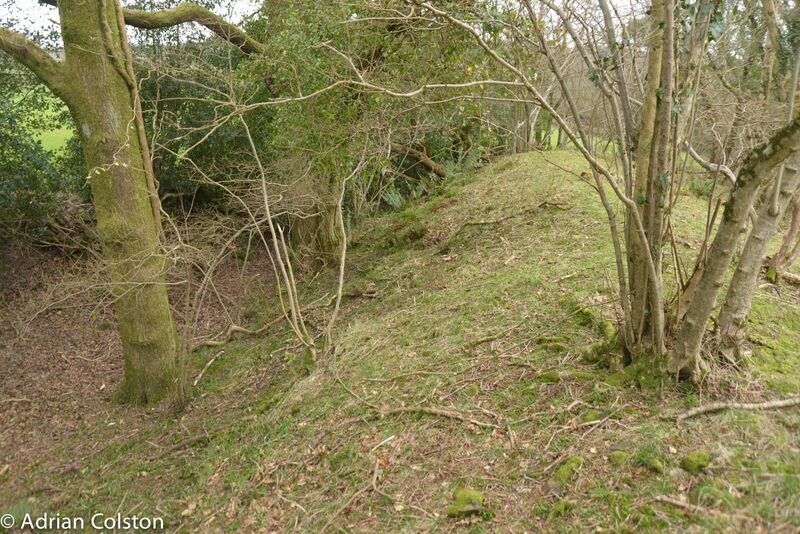 Many people will be familiar with Wooston Castle, the Iron Age hill fort above the River Teign and they may have thought that the open area you can visit today is the total extent of the place. This map however shows that the hill fort is actually much more extensive – the open area people visit is the ‘circular’ part at the top of the map – but there are number of deep ditches running away to the south – these are currently under trees – mostly conifers. 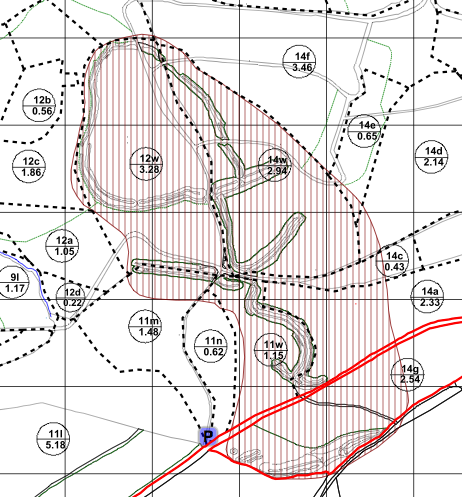 The hatched area on the map is the extent of the Scheduled Ancient Monument (SAM). Thanks to funding from the Heritage Lottery Fund the WT and the NT have been able to devise a project to clear all the trees from the SAM and if the Stage 2 HLF bid is successful (decision expected within a month) then a series of archaeological projects will be carried out over the next 5 years to try and understand more about Wooston Castle. 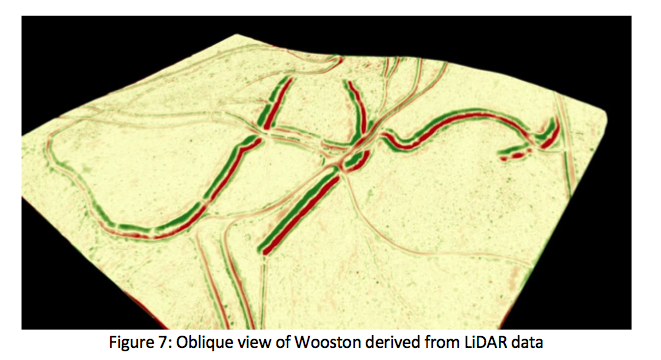 The NT and the WT have already been able to carry out a LiDAR survey of the valley (courtesy of HLF funding) and one of the early outputs is this wonderful 3D terrain map of the ditches at Wooston Castle. In total the SAM is around 15 acres in extent. Working in parallel with the survey and research aspects of the project work has now begun to clear the trees off the entire area. 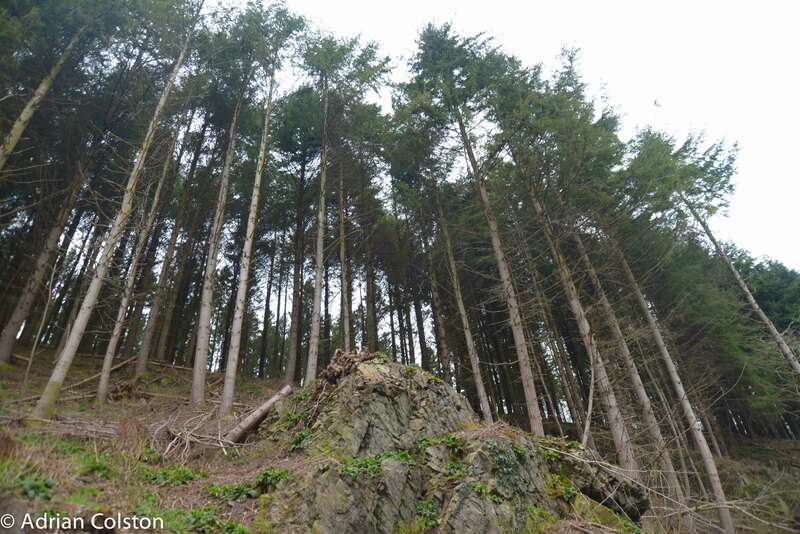 It will be really interesting to see this site reappear from the trees as the felling continues. 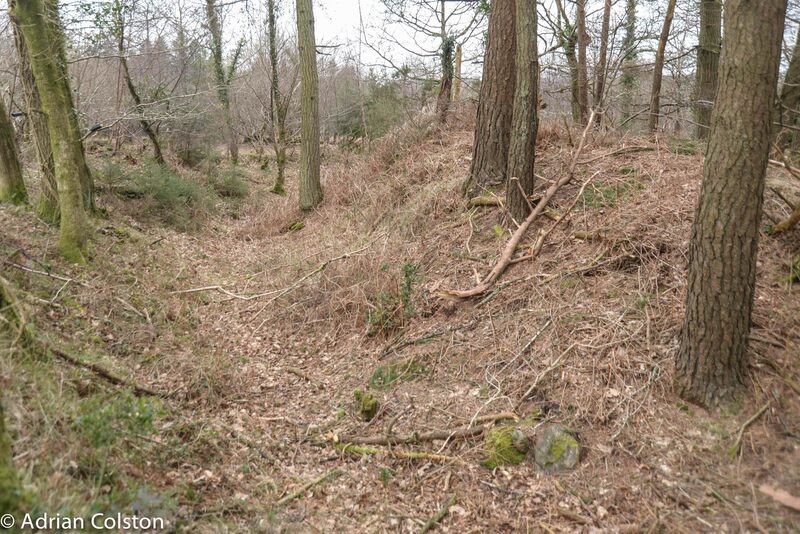 In addition to restoring the open status of Wooston Castle it will also create a large area of open habitats (a very rare feature in Fingle Woods) which will hopefully benefit wildlife such as pearl bordered fritillary butterflies. There are many more questions than answers when it comes to our understanding of Wooston Castle but hopefully over the next few years some of these will begin to be answered. If the HLF Stage 2 application is successful it is proposed that some excavations will take place. 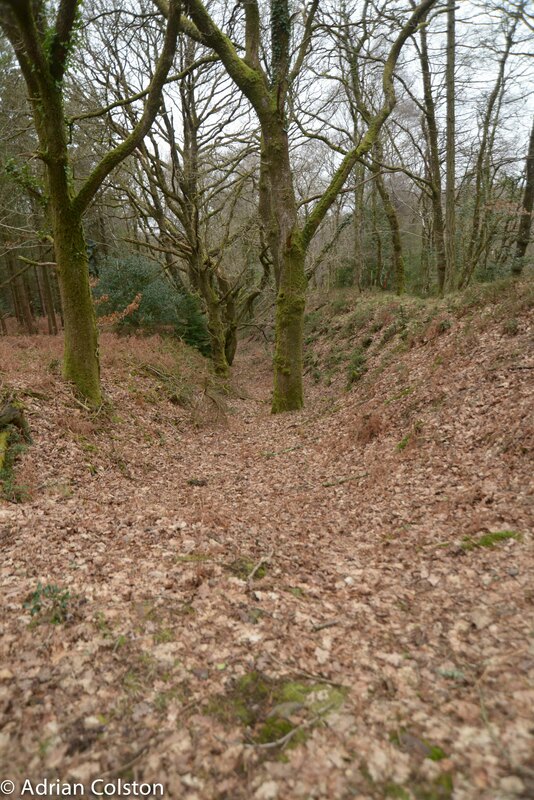 We might then begin to understand what the purpose was of the ditches to the south of the ‘main’ fort was and why there are four blind alley ditches. We might even have a chance of understanding how Wooston Castle relates to the two other nearby Iron Age hill forts Prestonbury and Cranbrook (both less than a mile away) – were they contemporaneous, all occupied at the same time etc etc? Exciting times ahead and with a bit of luck it might encourage some academic archaeologists to get involved with the site and help unravel the mysteries of two to three thousand years ago. Last night I gave a talk entitled ‘Fingle from the wildwood – a story of a changing climate, prehistoric people, their descendants and their impacts‘ at the Fingle Bridge Inn in Drewsteignton. 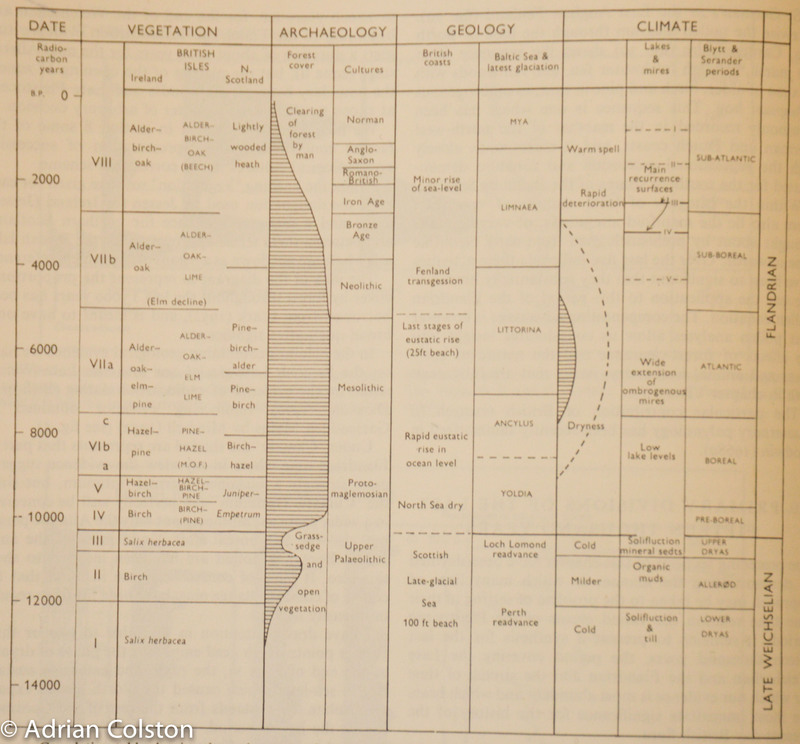 I tried to weave together the story of the end of the last Ice Age to the present time by looking at the pollen record, the climate, the actions of prehistoric people from the New Stone Age, Bronze Age and Iron Age and the impact of the extinctions of our mammal fauna over the period. I won’t try and reproduce it all here but you can download my Powerpoint presentation here (I have removed the photographs to make the file a more manageable size) – it may not make much sense if you didn’t hear the words that went with it! 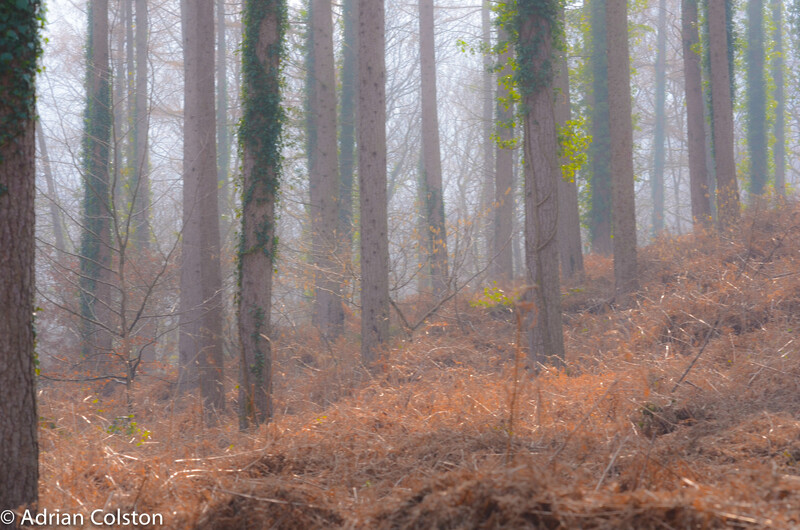 I started with this quote from Oliver Rackham “Conservationists do no service to woodland if they try to remake it on the image of what they imagine wildwood was like” – just in case anyone had a brainwave! I include here a few tables which people might find useful as they catalogue some of the key timescales and events. I then discussed what all this means, highlighted the huge gaps in our knowledge and talked about Frans Vera’s counter-theory that the ‘wildwood’ was in fact a savannah with ‘parkland trees’. A controversial theory but one which does help explain how the wildwood was cleared by a small number of people using stone axes. I talked about some challenges for the future: tree diseases, the growing number of deer, climate change and people. I finished the talk with a quote from Fingle Woods’ Spirit of Place statement – which Fingle Woods’ managers can use as a benchmark to determine whether their actions are appropriate. Over the centuries, people have changed the appearance of the landscape from heathland and wild woods to oak coppice and then to conifer, driven by local and then national need, influenced by fashion and economics. As a result, the gorge has been dressed in different ways. In the coming decades, we want to help the gorge to clothe itself again, reverting to its more natural state. Fingle Wood’s inheritance will help shape its future, making it a place of conservation in a changing environment, and inspiration and enjoyment for everyone – today and for the generations to come. Thanks to everyone who came and seemed to like what I had to say. Today we hosted the team of National Trust Forestry Advisors from around the country. We took them to Fingle Woods to meet our partners the Woodland Trust, show them around the site and tell them what we have been up to and what we plan next. These are some thinned conifers which are going to become teepee poles! 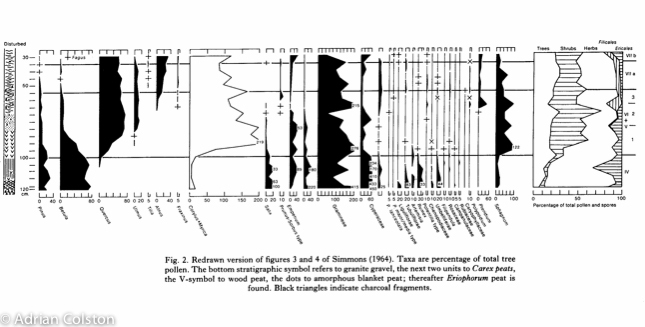 I have written before on the problems we have recently had with Phytophthorum ramorum infections in larch at Fingle (see here). The mandatory clearance work has now begun – as you can see it is quite a large area. Fortunately amongst the fallen conifers there are quite a lot of native deciduous trees and regrowth. 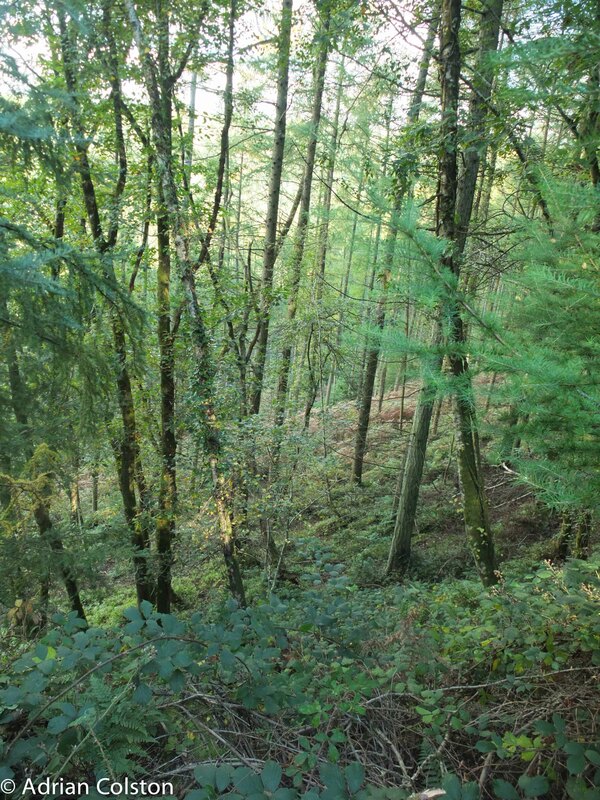 Last week we posted a piece on the Fingle Woods blog about an outbreak of the virus like disease Phytothphora ramorum which affects a variety of trees including larch – see here. 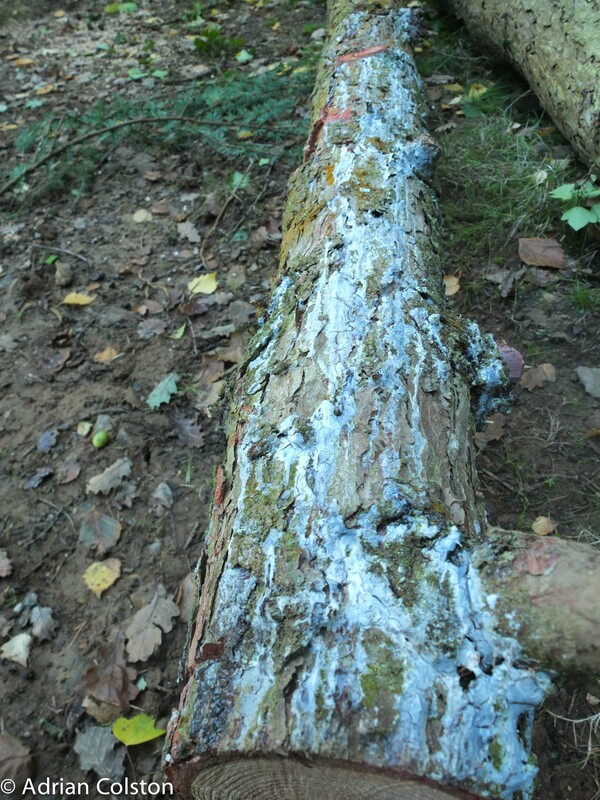 We have now had a second outbreak confirmed in Halls Cleave Wood which is part of Fingle Woods. The Forestry Commission’s Plant Health scientists were out this week to sample another Japanese larch they had identified from a aerial survey. I visited the area yesterday to see it for myself. 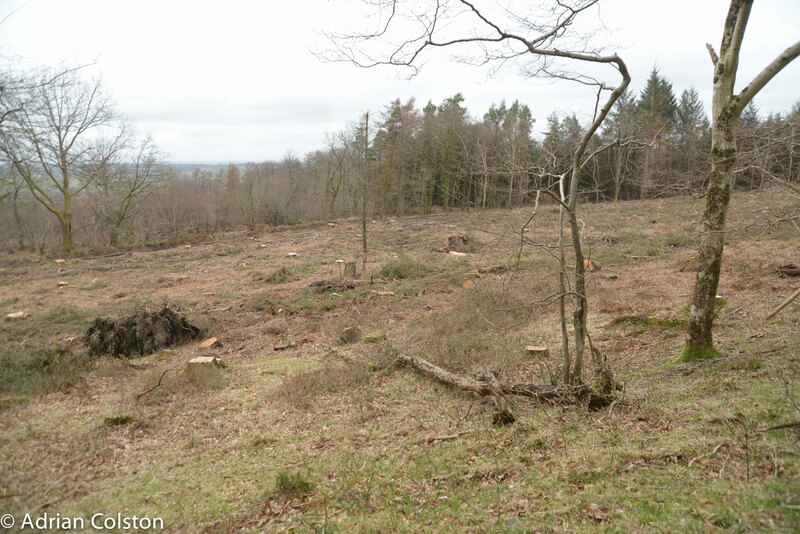 This is the surrounding area – all the larch trees will have to be removed with 100 metres of the infected tree. This work will start very soon. Fortunately the stand does contain a good understory of bilberry and various native broadleaves so we are hoping that the remedial works won’t be too damaging – indeed they could be seen as part of the woodland restoration. 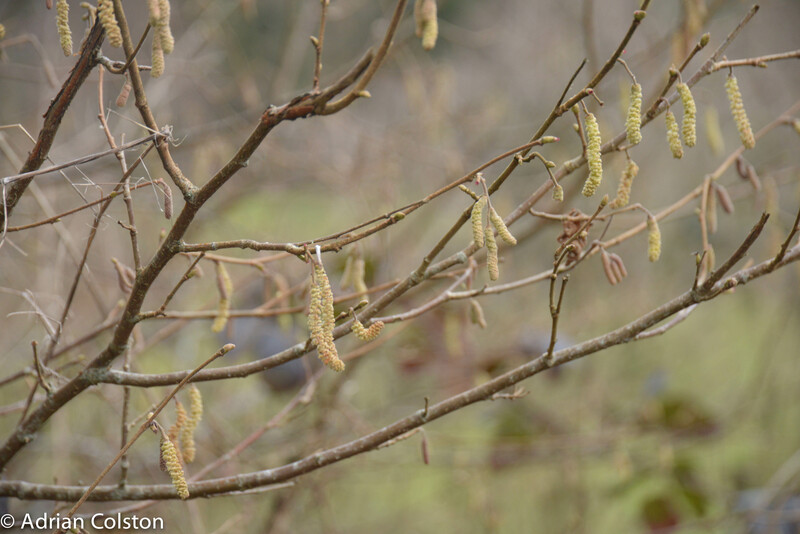 P. ramorum is very infectious and is spread by aerial spores so we will have to keep a close eye over the coming months and years on adjacent stands of larch and act accordingly. 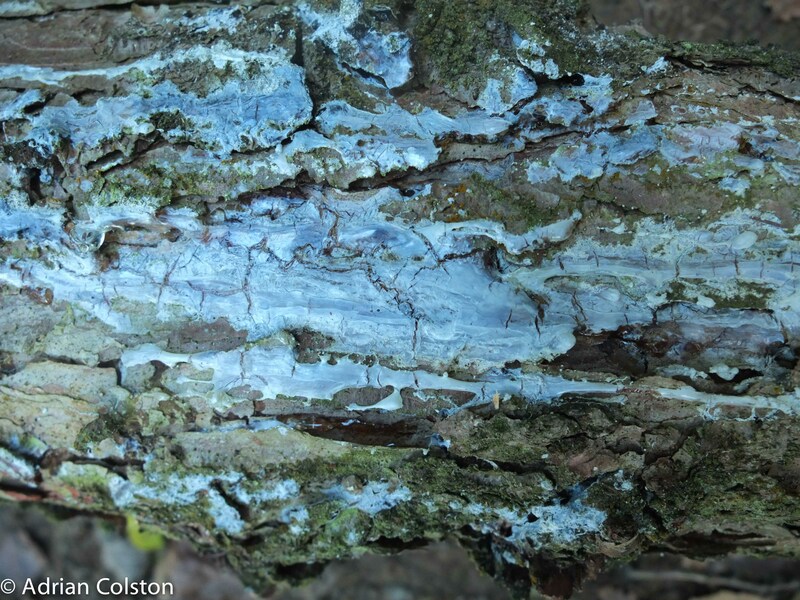 Rather worryingly P. ramorum can also infect bilberry – that is why we are acting very quickly. 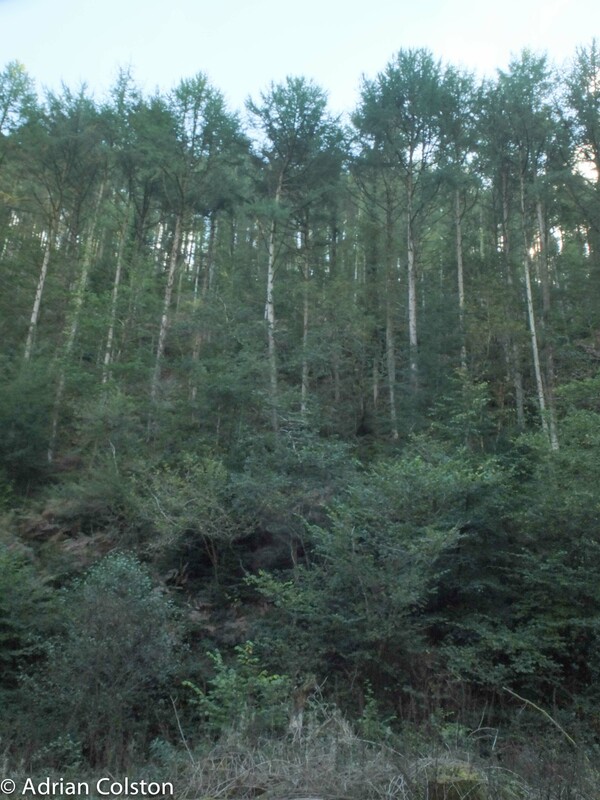 P. ramorum is a notifiable disease and we will soon receive a notice from the Forestry Commission instructing us to remove the surrounding trees. P. ramorum is endemic now in the south west and elsewhere in the UK and is having a devastating impact on conifers and other species particularly ornamental shrubs such as Rhododendrons in formal gardens. 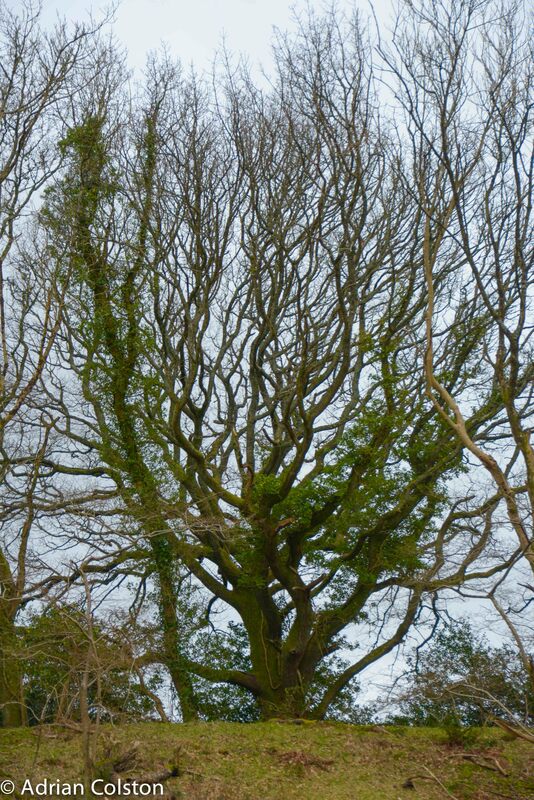 For more information on this tree disease see the dedicated Forestry Commission web site – here.